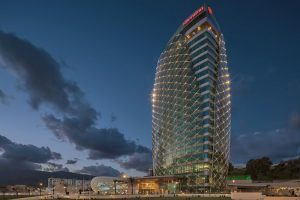 Marriott International, Inc (NASDAQ:MAR) today announced further expansion in Algeria with the opening of its seventh hotel in Algeria, Sheraton Annaba. The company already operates six hotels in Algeria including Constantine Marriott Hotel, Renaissance Tlemcen Hotel, Sheraton Club des Pins, Sheraton Oran, Le Meridien Oran and Four Points by Sheraton Oran amounting to 1580 rooms. With another six hotels under development the company is set to double its footprint in the country. Owned by Société d’Investissement Hôtelière, the imposing and welcoming Sheraton Annaba is conveniently located within easy access from the airport and the city’s most charming attractions. With its iconic and sophisticated design, and appealing dining options, the hotel offers stunning views of the azure Mediterranean Sea and the scenic coastal city. Guests can enjoy spectacular sea or city views and an unmatched level of comfort at the Sheraton Annaba. The hotel’s 201 elegantly appointed guestrooms, including 15 Executive Suites and a Presidential Suite, spread over 18 floors, offer a premium Sheraton Signature Sleep Experience. With elevated amenities and services, the hotel delivers effortless and personalized services in a seamless and efficient manner. Club rooms and Suites offer exclusive access to the Sheraton® Club Lounge, providing with additional tailored services and privileges. Located on the 19th floor with mesmerizing views, the Club Lounge provides the perfect backdrop for a complimentary breakfast, tea, coffee, drinks or light snacks to enjoy throughout the day and in the early evening hours. Whether it’s relaxing at the Lobby Lounge while enjoying Sheraton’s signature ‘Paired’ menu – comprising of artisanal small plates and bar snacks paired with premium wines – or indulging a meal at one of the distinctive restaurants, the Sheraton Annaba welcomes numerous culinary experiences and delights. Guests can relish international Mediterranean dining with live cooking at the all-day dining Feast, savor delicious patisserie at the Deli with take away, treat themselves to an upscale Italian dining experience at Al Pesto located on the 19th floor, or head for a relaxed drink with a game of snooker and some foot-tapping music at the Hugo Bar. In every way, the Sheraton Annaba spoils guests with choice. With over 1400 square meters of ultra-modern and state-of-the-art meeting facilities, endless connectivity through high-speed wi-fi, and a full-service business center, the hotel offers highly flexible meeting options and personalized services, making it the ideal venue for every need, be it intimate gatherings or larger social events and business meetings. Leisure facilities include a 24-hour fitness center for maximized workouts with cutting-edge equipment, an outdoor pool for a relaxing swim, a Spa and an outdoor tennis court. Situated on the north eastern coast of Algeria, Annaba is the fourth largest city in the country and the capital of Annaba Province, often referred to as the “Pearl of East Algeria”. It is one of Algeria’s main commercial hubs and also a popular tourist destination known for its beautiful beaches. With a warm and welcoming atmosphere, the Sheraton Annaba is where guests can make the most out of their stay, whether they’re traveling for business or for leisure. Copyright © 2019 Business Travel Magazine, All Rights Reserved.